If you are someone who likes to decorate for every holiday, then this is for you! I had such a huge response to my LOVE printable so I decided to create an Irish Blessing Subway Art for St. Patrick’s Day. Now, I’m not Irish, and I don’t really believe in luck (I believe in blessings from God) so it took me awhile to find something that I really liked. 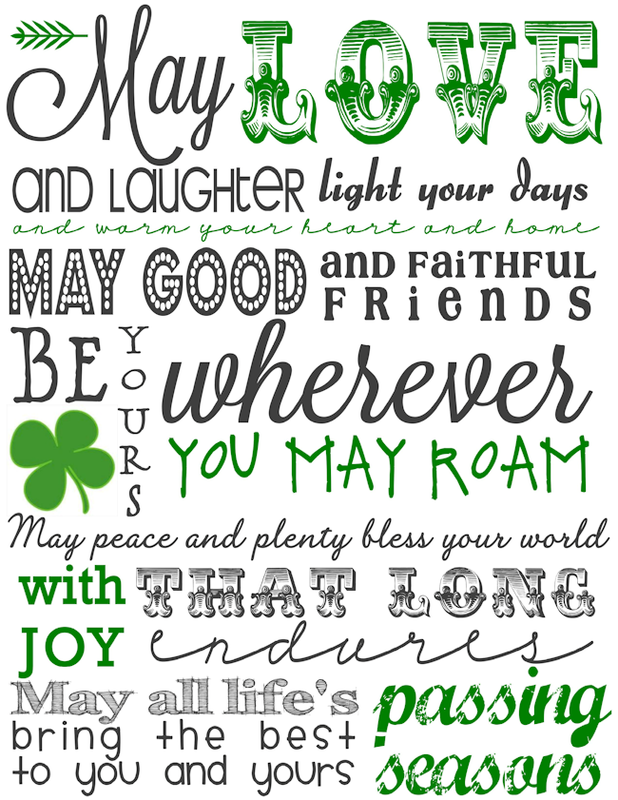 I came across an Old Irish Blessing and thought it was perfect! If you like this Subway Art you may also like my Valentine’s Day Subway Art based on 1 Corinthians 13. Available in Red, Black and Brown. « New Daily Deals Site Wants YOU! Thank you so much for always being so generous! this is such fun and I love the combo of fonts you chose! Thanks Diana i love it! What size frame will fit best? 5x7??? Okay, what's the trick. Love this subway art, but can't seem to figure out the download. :( Have an account and it still isn't downloading. Cathy, it should fit an 8x10 frame. Thank you for the printable. Do you know if there are other colors available or if you can edit the colors? I've printed a copy and will frame it tomorrow or I may buy a green mat and use a larger frame. I'm sure you'll see it on my blog soon with a link back to you. Thank you so much for this post. I want to let you know that I posted a link to your blog in CBH Digital Scrapbooking Freebies, under the Page 4 post on Feb. 27, 2012. Thanks again. Thank you so much for this post. I want to let you know that I posted a link to your blog in CBH Digital Scrapbooking Freebies, under the Page 3 post on Feb. 27, 2012. Thanks again. I love this!! I completely agree about blessings from God (not luck)! I love this! I was wondering if you would be willing to share what fonts you used? They are great! I love your printables! My friend told me about you on her blog. I think I am not printing it right, because it is too big for my 8x10 frame. I am just printing it on regular printer paper. Help! I am so challenged! Love your work and I love the irish blessing. Hard to find St. Pats stuff that is not about beer drinking! Any possible way to get this as a jpeg? I love it! I absolutely LOVE this!! I am having a slight problem, so perhaps you can help; when I print, the top and bottom of the image is cut off... it appears perfectly in my print preview and as a download. If you have any suggestions, I'd love to hear. If not, I will keep at it! I have shared this site with many people!! Thank you so much!! I love this! Sharing on my FB page today!